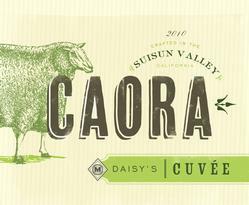 Caora is the Gaelic word for sheep. In honor of the sheep that graze our vineyards, this wine represents the sunshine and grass that nourish the sheep that nourish our vineyards. Aromas of nectar, lilac, and peach waft in the glass. This is followed by great acidity, a nice sweet finish, and a hint of citrus. This wine will take you to our vineyards on a warm spring day.